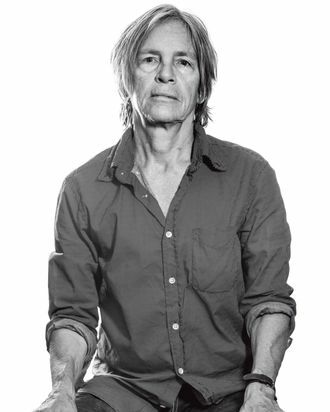 It’s not until we’re at the bottom of the 30-foot ladder, necks craned up at the bright West Texas sky, that Eileen Myles casually mentions that she’s afraid of heights. The rusty ladder is the only way to get to our destination, an old spring-fed railroad tank off a ranch road. Myles recently bought a small stucco house in Marfa, about 20 miles from here, and splits her time between rural Texas and the East Village apartment she’s lived in for four decades. Fortunately, the 65-year-old poet doesn’t seem inclined to let fear slow her down. She grips the railing and begins clambering up. Once at the top, she drops into the water and emerges wearing a broad, satisfied grin. Four decades into a writing career spent decidedly and defiantly in the underground scene, Myles is having an unexpected bout of mainstream success. Her first decade-spanning collection, I Must Be Living Twice: New and Selected Poems 1975–2014, will be released by HarperCollins on September 29; that same day, the publisher will reissue Myles’s influential, out-of-print 1994 novel Chelsea Girls. Myles’s first mimeographed book of poetry came out in 1978; since then, she’s published 19 books of fiction, poetry, and criticism. In 1992, she campaigned as an “openly female” write-in candidate for president. She toured the country as part of the lesbian, feminist spoken-word/performance-art group Sister Spit. Part of Myles’s enduring appeal is that she’s experimental in the true sense of the word; every time you turn around, she’s up to something different. “I keep trying to do something that will look good with everything,” she says, treading water. “But then the world changes and I have to make something entirely new.” She just finished her first sci-fi book, about a time-traveling dog. She considers it a memoir. Chelsea Girls was her first novel. Like the novels that followed, the story unfolds through a series of brief vignettes told in short, immersive bursts (“I thought of them as films just as much as stories,” Myles says, “or mistakes, or embarrassments — things I needed to exorcise”) about a character named Eileen: her tumultuous childhood in Massachusetts; her moving to New York to become a poet in 1974; her early, drunken, romantic years; her reckoning with her queerness and her substance issues. In one section, Eileen gets her photo taken by Robert Mapplethorpe. In another, she assists the ailing New York School poet James Schuyler, who is living in the Chelsea Hotel in a kind of glamorous squalor. Myles’s transition to a mainstream publisher hasn’t been seamless. Editors attempted to correct some of the punctuational and grammatical exuberances of her work. And Myles and her publisher spent weeks debating possible cover images for both books. Eventually, they found common ground: The reissued Chelsea Girls will feature a photo of Myles from 1980 taken by Mapplethorpe; I Must Be Living Twice uses a photo of Myles taken by Catherine Opie. In the Mapplethorpe photo, Myles peers out from behind a thick shag of hair, with eyes that look both knowing and slightly suspicious. (She was hung-over.) In the Opie photograph, Myles is older, no longer wary. She sits on a stool in front of a deep-red background, looking straight ahead, a lesson in powerful posture. As we swim and talk, I start to realize that despite her avant-garde bona fides, there’s something almost old-fashioned in Myles’s dedication to the capital-R romantic life of the artist, with all its attendant economic and emotional turmoil. When she was young, she moved to New York with the explicit goal of being a poet, and she never decided the idea was a childish notion she had to get over. And then she became a poet.